What’s better than having a ziplining operation in the West Kootenay? Having a second in the East Kootenay, of course. To oversee such an expansion would be difficult for one person to manage. Thanks to the cohesive teamwork of owners and brothers Todd and Jay Manton, both Kokanee Mountain Zipline in Nelson and Mineral Mountain Ziplines in Fairmont are zipping their way up and over expectations. Within a short time of operation, Mineral Mountain Ziplines has garnered nominations for Columbia Valley 2017 Rising Star Business and Columbia Valley 2018 Tourism Business of the Year while Kokanee Mountain Zipline has been nominated for Nelson 2016 Tourism Business of the Year and won the Nelson 2018 Entrepreneur/Start of the Year. Even though the pair of owners are brothers, they took different paths to get to where they are today. 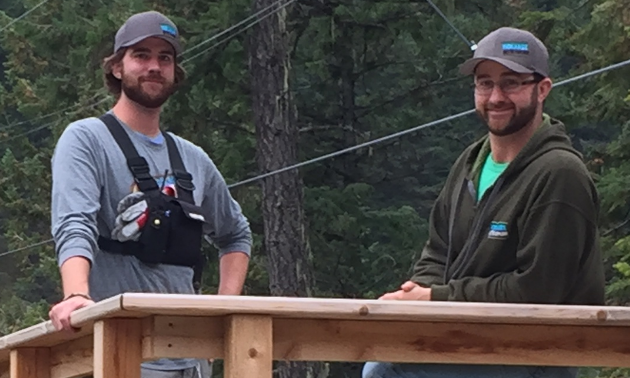 Todd started working in the zipline industry in 2010 in New Zealand and carried through various operations in B.C., while Jay worked in the construction industry as an engineer for eight years before the duo came together to create Kokanee Mountain Zipline. The majority of the questions posed to the Manton brothers were answered with a unified voice, with a few exceptions. Why did you choose this line of work? We chose the industry because we both love the outdoors and enjoy working with people. We also have a passion for skiing. Having a summer operation allows us to focus on chasing powder in the winter. What are some of your proudest accomplishments? Our proudest accomplishment as entrepreneurs was seeing our first customers go through the zipline course and realizing our dreams of opening the operation. Our proudest moments as business owners have been giving back to our community with fundraising ventures. What’s something interesting about yourself that not many people know? We may be the most overeducated zipliners in the world. We both have eight years of postsecondary education but only have a PhD in ziplining. What’s the biggest risk you ever took? Expanding our operation to the East Kootenay. It divided our time and attention to two vastly different markets. Once you experienced some success, how do you maintain and grow your business besides just doing the same thing on a bigger scale? Adding services to improve customer experience such as free pictures. We also look at upcoming trends and tweak our marketing strategies. What practical advice do you have for entrepreneurs? The harder we work, the luckier we get. Jay: Focus. I use it to solve problems quickly and efficiently. Todd: Humour. I use it to diffuse tension with employees as well as customers. How do you challenge yourself daily? Jay: Lifelong learning—always picking something new to learn. 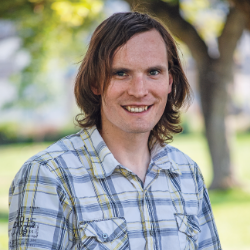 Todd: I challenge myself to connect with an employee or a customer daily. Our family. They are a source of inspiration and drive, as we drive them crazy talking about ziplining. What book do you recommend? Oh, the Places You’ll Go by Dr. Seuss. Finish this thought: Success is . . .
Dr. Eric Nelson has two dental offices in the East Kootenay and prides himself on balancing his work and family life. Natalia Pacheco, owner of Gravi Tea Coffee & Toys in Castlegar, has earned a place on our Top 10 Kootenay Business People 2019 list. Ian Benson supports Elkford and the entire Elk Valley through his labour contracting company and his charitable foundation.